Despite having a degree in theater and being a couple months away from a master’s in theater education, I am not well versed in the musical. My directing exploits have been purely straight-play. My interest in musicals has just never been extensive as I often find them trite and disengaging. However, as I start to launch into a search for a teaching position, I figure it would be good to hit some of the highlights. SINGIN’ IN THE RAIN, certainly, is one of the most famous. I watched SINGIN’ IN THE RAIN (1952) on 2.13.14. It was my first viewing of the film. Don Lockwood (Gene Kelly) and Lina Lamont (Jean Hagen) are silent film stars with a fake relationship. When the advent of sound hits, Lockwood and Lamont are very much out of their element. Lockwood’s friend Cosmo (Donald O’Connor) helps convince him to dub Lamont’s voice with that of Lockwood’s new girlfriend Kathy (Debbie Reynolds). This is a film about friendship, varying levels of ‘genuine’, and spectacle. Some musicals use the plot to set up the music. SINGIN’ IN THE RAIN doesn’t feel like one of these movies despite the fact that most of the music was set before the plot was settled on. Directors Stanley Donen and Gene Kelly keep the focus on character. Kelly had a notorious ego; he brought Reynolds to tears on set by denouncing her dancing and kept O’Connor in a state of terror. Yet, amazingly, the first two-thirds of this movie really allow his co-stars to shine. While Kelly’s mostly improved performance of the titular song is the most memorable moment, the best bits go to O’Connor. His Cosmo is the sidekick who excels the hero. O’Connor brings needed levity and humanity to the film. His bits are always spot on and are born from a vaudevillian style of physical and facial hijinx. Reynolds may be younger, but she holds her own. Sure, her voice was dubbed at times (not unlike the plot itself), but she still brings a necessary vulnerability to counter Kelly’s likable cocksure protagonist. Hagen is also exquisite as the antagonist Lamont. She goes from slightly likable and pitiable to an absolute villain. Her energy forces Kelly’s hand in a number of scenes which help form his character. Where Kelly’s Lockwood starts filled with ego and indifference, Lamont pushes him towards a choice with his new love Kathy. Without Lamont, the movie’s plot doesn’t soar. The music is all wonderful, save for a late number called The Broadway Ballet which is an over-produced and unnecessary diversion from the film (though those more appreciative of the music over the story will certainly disagree). 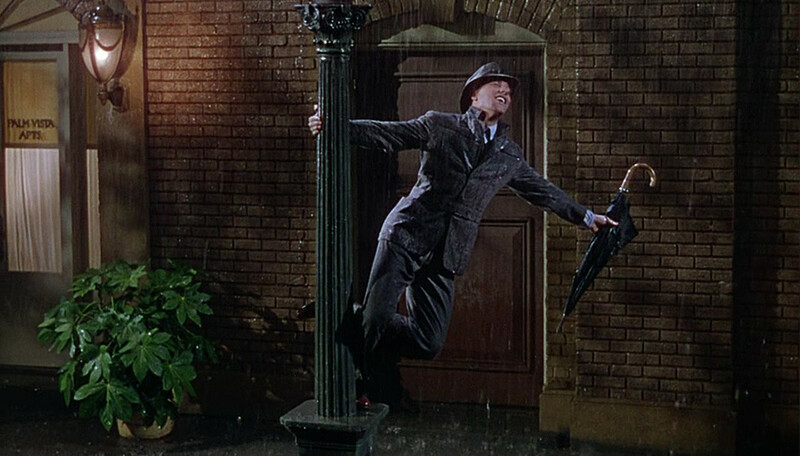 However, other songs like Good Morning, Singin’ in the Rain, You Were Meant For Me, and Moses Supposes are great. The biggest highlight of the film, however, is the high comedy of O’Connor’s Make ‘Em Laugh. The song is filled with power, energy, and hilarity. It is, in this reviewer’s limited musical experience, an all time great number. The dancing in the film works. While technically sound, the choreography is whimsical and light. Despite Kelly’s claims, Reynolds holds her own with the boys (who are clearly experts). I am no expert on the movie musical. This is ranked as the number 85 film on IMDB’s Top 250. In my personal list, I can certainly put more than 85 films above it. Yet, having now seen this classic, I fully understand why it is a classic even if the musical is not my genre of choice. If not for the over long Broadway Ballet number, this would be a great in my book. By choosing to derail plot with spectacle at a vital point, the film nearly lost me. I am very glad to have finally seen this, and would happily watch it again. No surprise here, the bonus is for excellent songs throughout. Really, a pleasurable experience overall. ~ by johnlink00 on February 13, 2014. Another positive review. I really need to see this. I hear you. It was on my embarrassment list.